Having just watched Lust for Life (1956), a biopic dedicated to Vincent van Gogh’s life and work, I was left wanting a deeper, less melodramatic exploration of his art and life. I decided it would be best to start with something a little more lightweight than van Gogh’s letters. This book, Van Gogh: A Power Seething, follows the artist’s life from the beginning, his travels, relationships, hopes and fears, punctuating his troubled and wandering life with explorations of his artwork and artistic outlook. The writing is rigorous, but at the same time, the author’s beliefs are glimpsed through the narrative, a fact that the author acknowledges from the beginning. Perhaps that’s the peculiarity of seeing it with the eyes of another artist, instead of an art historian. 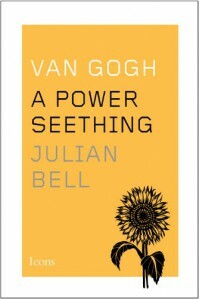 This book was written by Julian Bell, a writer who is also a painter, and who consequently seems to understand van Gogh not just intelligibly, but intuitively as well. He does not always agree with, or even understand, van Gogh’s actions. But one senses a kind of sympathy and understanding that seems to mirror Theo van Gogh’s attitude towards his brother, while still keeping a critical view of the facts that keeps this book from turning into a subjective retelling. Van Gogh’s artworks are intricately connected to the places he lived in and the people he knew. The sense of urgency in his paintings is frequently found in his letters, in which he muses about his ideas, techniques and themes. I particularly liked reading his thoughts on colour, which, combined with his distinct brush strokes, conveys the drama, emotion and unique perception that his artworks are best known for. In the end, this is an incredibly sad but relatable story. I recommend reading it with the paintings close at hand for reference, whether through the internet or a book. It’s a good read for those who are familiar with van Gogh’s artwork and would like to know his story a little better.